Fishpond Quickshot Rod Holder. The closest thing to having a full time rod caddie on the water with you. We have been waiting for years for somebody to come up with one of these that actually works! The Fishpond Quickshot Rod Holder is the closest thing to having a full time rod caddie on the water with you. We have been waiting for years for somebody to come up with one of these that actually works! A pack of GT’s at 2 o’clock 120’ out and they are coming in hot! Get that bonefish rod out of your hand and grab the 12wt that is neatly tucked onto the side of your pack. With the flip of the FidLock®, the switch has been made and it’s time to strip line, make the shot, and do battle. Having the right tool for the job when you need it is crucial for success. This is why we have designed a clean system that keeps your fully rigged rods fully secured, at the ready, and completely out of your way while fishing. From your favorite trout stream to far-off angling destinations, we have your success in mind. * FidLock® magnetic buckle with elastic cording adjustment secures the rod handle into the rod cradle, and releases your fully rigged rod with just one quick pull. 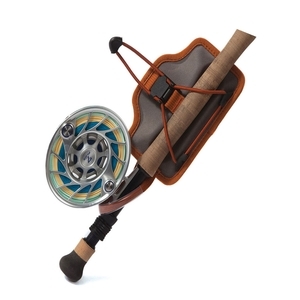 * Custom made clip on back attaches the rod holder to the side of most waterproof Fishpond packs. * 5.5" x 4.5" x .56"